ANCHORAGE, Alaska — The Trump administration announced Wednesday it will not list the Pacific walrus as a threatened species based on diminished Arctic Ocean sea ice, concluding that the marine mammals have adapted to the loss by foraging from coastlines. U.S. Fish and Wildlife Service officials said they cannot determine with certainty that walruses are likely to become endangered "in the foreseeable future," which the agency defines as the year 2060. The decision likely will be challenged in court, said Shaye Wolf, climate science director for the Center for Biological Diversity, who wrote the listing petition filed in 2008. She called the decision a misrepresentation of science to reach a predetermined conclusion. "They did not want to list. This is an anti-science, anti-wildlife administration that denies the reality of climate change, which is the primary threat to the walrus," Wolf said. "Admitting that the walrus is threatened by climate change acknowledges that climate change poses a real danger to people and wildlife, and they don't want to do that." Walruses in the last decade have been forced ashore in unprecedented numbers, resulting in deaths, especially of young animals, and long swims for nursing females and other walruses to find food. "They're not adapting, they're suffering," Wolf said. The Fish and Wildlife Service said in 2011 that walruses deserve the additional protection of being declared threatened, but delayed a listing because other species were a higher priority. The agency revised the decision based on new information, said Patrick Lemons, the agency's marine mammals management chief in Alaska. "Walrus demonstrated much more ability to change their behaviors than previously thought," Lemons said. Their ability to rest on shorelines before swimming to foraging areas makes the threat of less sea ice uncertain, he added. Older male walruses spend summers in the Bering Sea. Females with calves ride sea ice north as it melts in spring and summer all the way through the Bering Strait into the Chukchi Sea. The ice provides a moving platform, giving walruses a place to rest and nurse, and protection from predators. In the last decade, however, ice in the Arctic Ocean has melted far beyond the shallow continental shelf over water too deep for walruses to reach the ocean floor. Walruses instead have gathered by the thousands on beaches in northwestern Alaska and Russia, where smaller animals are vulnerable to being trampled in stampedes if the herd is spooked by a polar bear, hunter or airplane. In the last six years, Lemons said, protections put in place in Alaska and Russia have greatly reduced trampling deaths. "Right before the 2011 finding, there had been reports from Russia that three to ten thousand animals had been trampled and died on land-based haulouts in Russia," he said. Since then, the numbers of trampled animals have been in the tens to low hundreds, including about 100 this year at Point Lay in northwest Alaska, he said. Walruses also have shown a willingness to swim great distances of 130 miles (210 kilometers) or more from coastal haulouts to prime foraging areas, he said. The Fish and Wildlife Service used climate models showing the Chukchi Sea between northwest Alaska and Russia could be ice-free in the summer by 2060, Lemons said. But he said information predicting the walruses' fate is uncertain beyond then, so the decision was made not to list the species. The agency in 2011, using aerial surveys, estimated the walrus population at 129,000. More accurate mark-and-recapture studies put the population at closer to 280,000, Lemons said. Managers six years ago expressed concern that walrus hunting could have an effect on the population. However, a lack of access to walrus due to poor ice conditions have lowered the harvest by Alaska Native hunters by one-third to one-half, Lemons said. An upcoming study of the effect on walruses having to swim hundreds of extra miles to find food contains too much uncertainty in its models to predict how the population will be affected, Lemons said. "That's a huge energy stress," she said. Sea ice loss is projected to get worse, Wolf said, forcing walruses to shore more frequently and in greater numbers. A listing would add resources to walrus protection and raise public awareness of the climate change threat and the need to reduce greenhouse gas emissions, Wolf said. Alaska's Republican congressional delegation hailed the decision. 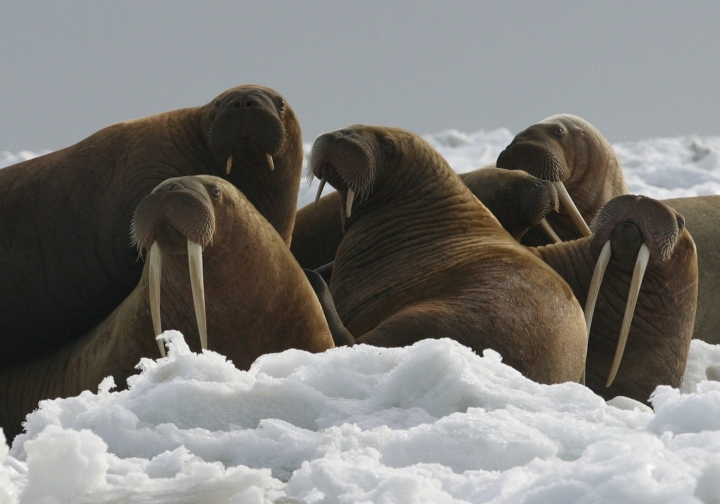 "I welcome this action by the USFWS, a decision that recognizes the health and stability of Alaska's walrus population and ignores the extreme political pressures often associated with new Endangered Species Act listings," Rep. Don Young said. Besides Pacific walrus, the Fish and Wildlife Service found that 24 other species did not warrant protections under the Endangered Species Act, including the Northern Rocky Mountains fisher and the boreal toad. The Northern Rockies fisher is a fanged, cat-sized predator that once ranged across at least five states and thrives in old-growth forests. It's now limited to a much smaller area straddling the Montana-Idaho border. Wildlife advocates last year submitted a petition for protections based on habitat loss and accidental trapping. Fish and Wildlife Service officials said they found no evidence that fisher populations were in decline because of trapping, climate change, logging or other potential threats and that the fisher had successfully adapted to past shifts in habitat when glacial ice sheets melted. Matthew Brown in Billings, Montana, contributed to this report. This story has been updated to correct the spelling of the climate science director's last name to Wolf, not Wolfe.